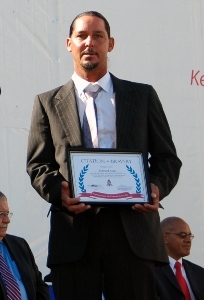 (CNS): Edward Azan (left), Charles Ebanks and Ray McGuire, who are well-known across the Cayman Islands for their intervention in an armed robbery at a liquor store, all received bravery awards on Monday, when Cayman celebrated its National Heroes Day. The three men, who have also received honours from the police and are forever associated with the local catchphrase "Not today, BoBo! ", were instrumental in the capture of two young suspects, who were eventually jailed for their part in a daylight heist at Blackbeard’s in Grand Harbour. Two unarmed police officers were also cited for their bravery in the face of an escaping armed robber in Bodden Town. All five of the awardees were honoured for their “exceptional courage in keeping the Cayman Islands community safe for all residents,” officials stated. The awards were handed out during a ceremony celebrating all of Cayman’s National Heroes, brave citizens and cultural heritage pioneers. Seventy Cultural Heritage Pioneers, who received honours in five categories, were chosen from among nominations from their peers for their stellar contributions to the “preservation and promotion of cultural heritage” in the Cayman Islands, including Caymanian cultural icon, 105-year-old “Aunt” Julia Hydes, who is still playing the drums and entertaining young and old alike. Well done to these three fearless young men. I only know Edward as a personal friend and have found him to be kind and very respectful. Well deserved, guys! Can anyone explain to me what an "emerging pioneer" is? It's very similar to "coming out of the closet". Everybody knew that they were pioneers all along, but it's only being acknowledged now. Ray McGuire is a thoroughly decent man who, (like many expat workers) was a loyal and respectful member of Cayman Islands society. I say was, because as is typical of many expat employees on this island, he was forced to work long, exhausting hours for little recognition or remuneration from his employer. Working 12 to14 hours a day, 6, sometimes 7 days a week, building a thriving retail delicatessen and catering service from scratch, Ray and his dear wife decided that enough was enough and looked for a betterstandard of living in their home country of Canada. That was in 2011. As has now been recognised, (albeit belatedly) this quiet, unassuming man had a heart of steel and wasn't easily moved to complaint or self pity. On the day of this incident he did as he felt was necessary to protect the rights of his fellow citizens to live in peace and safety, without thought for his own welfare. It is therefore a crying shame that Ray was effectively forced from the island and people he loved so much by greed and a blatant disregard for his skill as a first rate chef and human being. He is fondly missed by his North Side friends and we hope that both he and Michelle come back to Cayman soon. One final observation, this man risked his life to ensure that bad people don't prosper at the expense of good people. He placed himself in harms way so that others didn't have to. The least the Cayman Islands government could have done for him was to offer Cayman citizenship for his bravery on that day and ensure that he stayed amongst the people he served so well. No one is disrespecting Charles Ebanks or any other responsible citizen. But you on the other hand are an idiot who needs to read more, comment less and get an education. Talking about heroes. I wonder why all the people that did things to save the Island from destruction , which are deceased are not remembered as a heroe . I am talking about who wanted to dredge the sand from the sand bar,known today as stingray city , was Mr Jim Bodden in the 1960s. Who stoped it from happening by haveing a pititon signed by Caymanians to stop it. Was Captian Kadie , real name is James Cadion Ebanks, and many other things that he did in the devolopment of the Island in 16 years of serveing as a LA member . Look today at how many people are makeing a living from that sand bar . Congratulations to all of them but wasn't it rather tactless to schedule the ceremony for 27 Jan, which is Holocaust Memorial Day? national hereos day is always on the 4th monday of January and has nothing to do with Holocaust Memorial day. i see nothing tackless about it. For years our celebrations have been held on the last monday of January. Yes, the Halocaust was deplorable but why should Cayman bow and bend and step aside and change our Agenda for every thing that might be happening in other parts of the world? No one has a monopoly on any one date!! Life must go on. Quite right, typical bad CIG planning. It would have been so much nicer if you had just taken a few moments to do a bit of research because you would have found OUT that NATIONAL HEROES DAY is commemorated ANNUALLY on the FOURTH MONDAY OF JANUARY – unlike your birthday which is always celebrated on the same DATE each year!! Then it should change to a more appropriatesystem. Dates are important for commemoration as well as celebration, however, it is insensitive for one to overlap the other considering the gravity of a worldwide recogined event such as Holocaust Day. Just because the day is celebrated on a date, doesn't mean that a public holiday can't follow on the next appropriate day. Take Mayday for example, the 1st doesn't always fall on a Monday, neither does the Queens birthday for that matter. And honestly, is it necessary or financially expedient to have a holiday for such an event, can the island still afford such back slapping nonsense. These men were undoubtedly brave and deserve every ounce of congratulation and reward, but everyone else doesn't. Get back to work Cayman. Who the hell are you to say what is a more appropriate system for Cayman?! Holocaust Day is not commemorated in Cayman. First I have heard of it. Get over it. It would be much more appropriate to celebrate Emancipation Day. I am sure that the many holocaust survivors in Cayman were horrified.